While among most other races the average chest-girth measures over one-half the average stature, that of the Jews, it has been alleged, does not reach this standard. Goldstein has therefore concluded that the Jews are inferior in this regard, and he credits them with a lesser "index of vitality." On this account, also, it has been stated that the Russian and Austrian Jews are not fit for military duties. 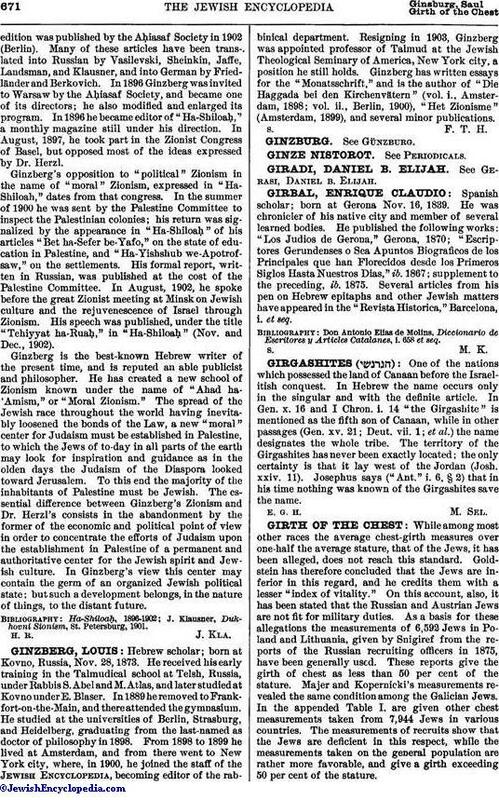 As a basis for these allegations the measurements of 6,592 Jews in Poland and Lithuania, given by Snigiref from the reports of the Russian recruiting officers in 1875, have been generally used. These reports give the girth of chest as less than 50 per cent of the stature. Majer and Kopernicki's measurements revealed the same condition among the Galician Jews. 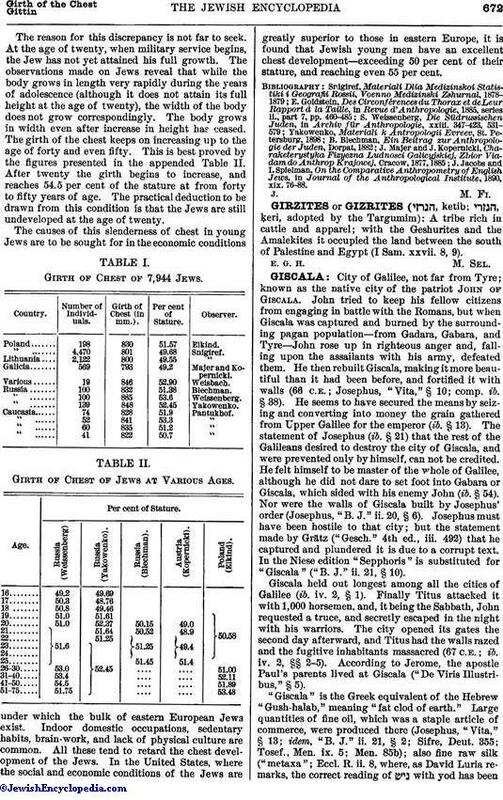 In the appended Table I. are given other chest measurements taken from 7,944 Jews in various countries. The measurements of recruits show that the Jews are deficient in this respect, while the measurements taken on the general population are rather more favorable, and give a girth exceeding 50 per cent of the stature. The reason for this discrepancy is not far to seek. At the age of twenty, when military service begins, the Jew has not yet attained his full growth. The observations made on Jews reveal that while the body grows in length very rapidly during the years of adolescence (although it does not attain its full height at the age of twenty), the width of the body does not grow correspondingly. The body grows in width even after increase in height has ceased. The girth of the chest keeps on increasing up to the age of forty and even fifty. This is best proved by the figures presented in the appended Table II. After twenty the girth begins to increase, and reaches 54.5 per cent of the stature at from forty to fifty years of age. The practical deduction to be drawn from this condition is that the Jews are still undeveloped at the age of twenty. TABLE I. Girth of Chest of 7,944 Jews. Girth of Chest (in mm.). Poland 198 830 51.57 Elkind.
" 4,470 801 49.68 Snigiref. Lithuania 2,122 800 49.55 "
Galicia 569 793 49.2 Majer and Kopernicki. Various 19 846 52.90 Weisbach. Russia 100 832 51.38 Blechman.
" 100 885 53.6 Weissenberg.
" 139 848 52.45 Yakowenko. Caucasia 74 828 51.9 Pantukhof.
" 52 841 53.3 "
" 60 835 51.2 "
" 41 822 50.7 "
TABLE II. Girth of Chest of Jews at Various Ages. under which the bulk of eastern European Jews exist. Indoor domestic occupations, sedentary habits, brain-work, and lack of physical culture are common. All these tend to retard the chest development of the Jews. In the United States, where the social and economic conditions of the Jews are greatly superior to those in eastern Europe, it is found that Jewish young men have an excellent chest development-exceeding 50 per cent of their stature, and reaching even 55 per cent. J. Jacobs and I. Spielman, On the Comparative Anthropometry of English Jews, in Journal of the Anthropological Institute, 1890, xix. 76-88.